Dorms KL is fresh, bright, and its central location is within walking distance to KL’s famous attractions. In our comfortable Café Lounge guests can experience TG Nasi Kandar’s local food at special promotional prices, or just relax and meet like-minded travelers. we have 24/7 reception! There is also a terrace bar where you can relax during the day, watch netflix or youtube, and where you can socialize every night when there is a bartender on shift, music, and games to help you meet other travelers. After midnight the staff will keep the party going by taking the guests on the short walk to the bar street. Our 6-8 bed air-conditioned dorms are complete with individual lockers and a power-plug for every bed. Your stay includes a simple local breakfast, WiFi, a map of the city, and insider tips from our knowledgeable staff, all free! Guests can also store their luggage in our luggage storage room at no charge. There is no curfew, so you can come and go as you please. Our staff are always ready to help! 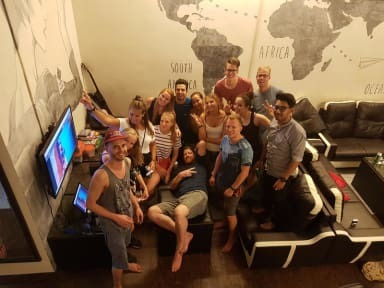 Fun times and great memories await...We look forward to welcoming you into our hostel family! one of the best dorms during our trip. Staff is wonderful and the breakfast is amazing. private rooms were small but the dorms were good. Great hostel if you're in for a party, there's one on the roof literally every night. Don't forget to bring your earplugs as there is no silence inside the hostel due to this party mode. Enjoyed my stay. Friendly staff with good advice. Good atmosphere and good location. Only feedback; beds are a bit short, so if you are tall its better to check. Let me begin by saying that the staff is absolutely awesome. Alex and his wife will do everything to make you feel at home (and so do all the other staff members). The hostel itself is located perfectly (i.e. most grab rides will cost you max 8 RM). Moreover, the beers are relatively cheap!! During my stay, the overall atmosphere wasn’t that fantastisc. It sometimes felt more like a big hotel, rather than a backpackers accomodation. But yeah, this is my personal experience. Niet muisstil, echter wel erg sympathieke mensen en gelegen op een mooie plek; de foodstreet om de hoek, China town en de torens op loopafstand! Voordelen: de ligging is helemaal top! Zit ook lekker restaurant voor het hostel. Nadelen: De bedden zijn veel te kort en ik ben niet eens lang. De kamers zijn heel erg gehorig, je hebt totaal geen personal space. Staff did what they had to do at check-in, but didn't ask how i was doing, didn't say anything, no smile, no joy, hardly made eye contact. No personal touch at all, Staff could be more personal and happy towards guests. But maybe i caught them at a bad moment.